I've mostly been knitting socks in the last few weeks. Now it's time to finish up the mates to the first socks. I don't plan to suffer from Second Sock Syndrome and leave these socks without a mate. They look a little funny right now as they are unwashed and unblocked. On the left is another Friends sock (see yesterday's post. This is Copper Corgi sock yarn in the Painter's Sky colorway. This is the first Friends sock that I did but I decided to switch to the Peach State color for the pattern as light colors generally photograph better. The second sock hasn't been started yet. In the middle is Triple Texture, my own pattern. It was temporarily set aside while I was working on Christmas gift knitting. The second sock is on the needles and about a third has been completed. The yarn is from the Yummy Yarn Studio and the colorway is called My BFF. On the right is a generic sock knit in stocking stitch. I saw a pair of socks knit in this yarn on Susan B. Anderson's blog and had to get some and make a pair for myself. The color is called Cherry Blossom and it's hand dyed from Cakewalk. Yarns. I'm almost finished this pair, working on the foot, and it will be the next pair to be finished. I've since added two more colors to my sock yarn stash. 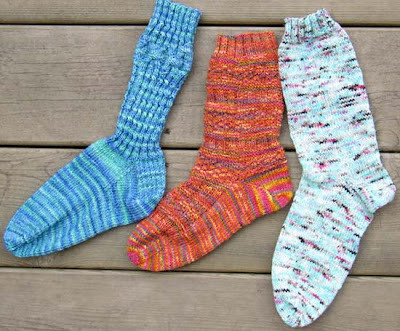 The one thing that all three of these sock yarns have in common is that they are from independent dyers. There are many exciting yarns coming from personal dye studios and I'm powerless to resist them.